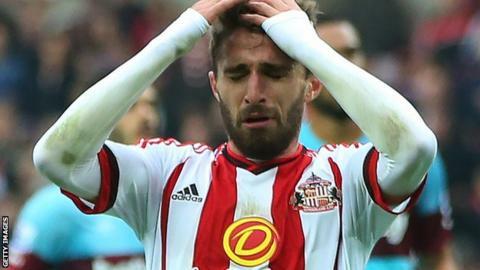 Sunderland need to pick up points in November's Premier League matches, with a "tough" December to come, says striker Fabio Borini. Crystal Palace host the Wearsiders on Monday, before Stoke City visit to the Stadium of Light on 28 November. Manchester City and Arsenal, the current top two, plus champions Chelsea among their opponents in December. "We have to get something from these games because December is a tough month," Borini told BBC Newcastle. "Not just because it is Christmas, because in England you don't stop so you play every three days, it's tiring for the players but also the quality of the opponents. "In England you don't have easy opponents. It's always been hard to beat the small teams. "Leicester, Watford, Bournemouth - you can see they all want to stay in the Premier League, they don't maybe have the quality but they all have put in the effort, desire and hunger to stay in there." Sam Allardyce's side have just six points from a possible 36 so far, with their only win coming in the local derby against Newcastle in October. Four points separate the Black Cats from a safe position outside the bottom three. "There is urgency to get results, the season won't last forever," Borini said. "The more games we play, the less are left, and the more we need to get if don't win." Neymar: Better than Messi & Ronaldo? Read more on Neymar, Messi, Ronaldo: Is Brazilian now world's best player?